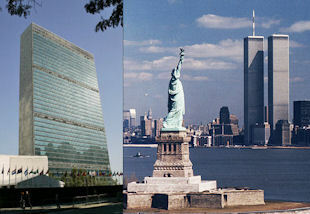 The next Vigilant Guardian--for the year 2001--was actually being conducted at the time the 9/11 attacks occurred. One can only imagine what NORAD personnel must have thought when the real-world events of September 11 so closely resembled a scenario they had encountered in the previous instance of that day's exercise--a suicide pilot trying to crash a large jet plane into a New York skyscraper. On June 5, 2000, the Continental United States NORAD Region (CONR) was conducting an exercise called Falcon Indian, in which its three air defense sectors in the continental U.S. took part. Two scenarios were practiced for that day in which hijackers planned to crash an aircraft into a well-known, "high-value" target in New York or Washington. Just a few months before Richard Myers revealed the existence of these five exercise scenarios, USA Today and CNN reported that NORAD had conducted exercises in the years before 9/11 that simulated hijackers crashing aircraft into buildings in the United States. Some of the scenarios that had been practiced for were described. It is unclear whether any of them correspond with the five later outlined by Myers, although, from what has been reported, it appears they were separate scenarios, additional to those in Myers's list. How could it have happened that the organization responsible for defending U.S. airspace repeatedly practiced scenarios that so closely resembled the 9/11 attacks in the years leading up to those attacks? And considering that the existence of these plane-into-building training scenarios has largely gone unreported, might there have been other, similar scenarios practiced for by NORAD--or other U.S. military organizations--that we do not yet know of? A new investigation into 9/11 is clearly urgently required. And the role of these training scenarios is one of many aspects of the attacks that must be thoroughly examined. Senate Committee on Armed Services, Implications for the Department of Defense and Military Operations of Proposals to Reorganize the United States Intelligence Community. 108th Cong., 2nd sess., August 17, 2004. Ibid. ; William M. Arkin, Code Names: Deciphering U.S. Military Plans, Programs, and Operations in the 9/11 World. Hanover, NH: Steerforth Press, 2005, p. 545. Senate Committee on Armed Services, Implications for the Department of Defense and Military Operations of Proposals to Reorganize the United States Intelligence Community. Greg Schneider, "FedEx to Buy 10 Airbus Super-Jumbo Jets." Washington Post, January 17, 2001. William M. Arkin, Code Names, p. 545. Senate Committee on Armed Services, Implications for the Department of Defense and Military Operations of Proposals to Reorganize the United States Intelligence Community; William M. Arkin, Code Names, p. 362. Do you have any information supporting the claim that Chic Burlingame, the Captain of AA77 had been invlved with the red team-blue team analysis of the strengths and weaknesses of the Pentagon's ground-to-air or other defense systems within one or two years before 9/11? P4T...Pilots for 9/11 Trut...has had some information about this connection but I do not belong anymore nor do I successfully communicate with them...a mutual disrespect agreement.